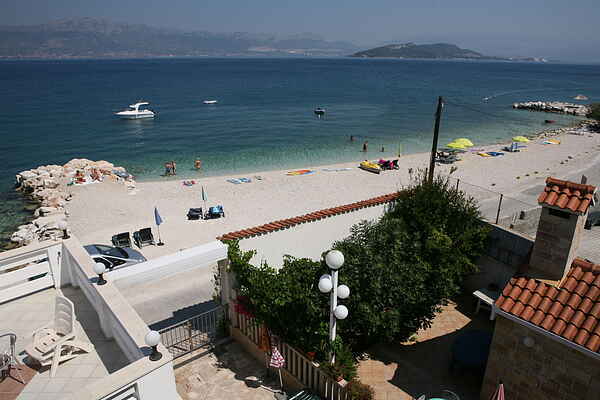 Beach apartment Bonacic is situated on Ciovo, a central Dalmatian island, connected to the continent and ancient city of Trogir by a drawbridge. Little fisherman and tourist village Slatine has excellent transport connections with major Europian cities since it is only 12 km far from Split international airport. Your apartment is only few steps away from the beautiful pebble beach. Located on the first floor apartment features living/dining room, nice open kitchen, comfortable bedroom, bathroom and spacious balcony with stunning sea view. You are welcome to use charming open kitchen as well as spacious shared terrace with an amasing sea view. Within the distance of 1 km you will find restaurant, caffees, grocery store, tourist office and much more. Convenient boat connection Trogir - Slatine - Split is a perfect opportunity to visit pearls of the Adriatic Split and Trogir. UNESCO protected city of Trogir with its rich cultural heritage preserving the spirit of antique times is only 8 km away. There are boat excursions to the nearby islands on dayly basis.